Whanganui MP Chester Borrows has denied careless driving causing injury to a protester’s foot. 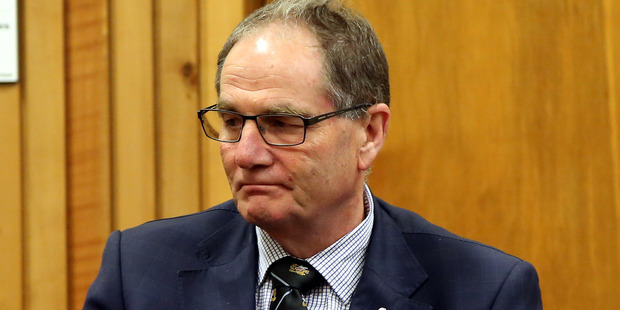 Borrows, who is also deputy speaker of the house of representatives, appeared in the Whanganui District Court this morning, charged under his birth name Kerry James Borrows. He allegedly drove into anti-Trans Pacific Partnership protesters Tracey Treadwell and Denise Lockett, while driving visiting Social Housing Minister Paula Bennett around Whanganui. The incident happened on Liverpool St on March 22. Borrows was remanded at large. His next appearance is September 13. Whanganui MP Chester Borrows is next scheduled to appear in the Whanganui District Court on a charge of careless driving causing injury on October 17 at 2.15pm. The charge relates to an incident that happened at a protest against the TPP outside Whanganui’s Collegiate Motor Inn in Liverpool St on March 22. Borrows pleaded not guilty to the charge at a court appearance in August. Whanganui MP Chester Borrows has denied a careless driving causing injury charge. Whanganui MP Chester Borrows appeared in Whanganui District Court on Monday facing a charge of careless driving causing injury. Mr Borrows, who is deputy speaker of Parliament, is charged under his birth name Kerry James Borrows. He has pleaded not guilty. He allegedly drove into protesters Tracey Treadwell and Denise Lockett outside Whanganui’s Collegiate Motor Inn in Liverpool Street on March 22. Ms Treadwell – who was treated at Whanganui Hospital after the incident – and Ms Lockett were among a group of protesters opposed to the Trans-Pacific Partnership. Mr Borrows was at the Motor Inn attending a breakfast meeting of the Whanganui Chamber of Commerce with Social Housing Minister Paula Bennett. He drove away from the meeting with Ms Bennett as his passenger and was leaving the Motor Inn driveway when the alleged incident occurred. Various arguments were presented in court on Monday, all of them suppressed. Judge Jim Large made no decision. The matter comes up again in the Whanganui court on November 17, with all attendance excused. Whanganui MP and deputy speaker Chester Borrows will stand down at next year’s election. Mr Borrows – who is headed to trial over a charge of careless use of a motor vehicle causing injury – entered Parliament in 2005 and was a former Minister of Courts. He said he had always thought that four terms would be an ideal tenure, and was particularly proud of the youth justice reforms he worked on. I dare say he’ll be applying to run the prisons now. The MP for Whanganui, Chester Borrows, is headed to trial over a charge of careless use of a motor vehicle causing injury. It follows an incident at a protest against the Trans Pacific Partnership, in Whanganui in March, in which two people allege they were injured. It happened as Mr Borrows and Cabinet minister Paula Bennett were leaving a breakfast meeting in Whanganui. Mr Borrows has pleaded not guilty. The National MP and deputy speaker of the House appeared last month in the Whanganui District Court, where all evidence and argument in relation to the charge were suppressed. No trial date has been set and wide-ranging suppression orders remain in place. Bent Cops and other scum. 01 Home Invasion (drugs 1984) JERRY CORNELIUS aka James Creedmore, Detectives COLIN IRVINE, Peter Scott, Rob Butler et al. 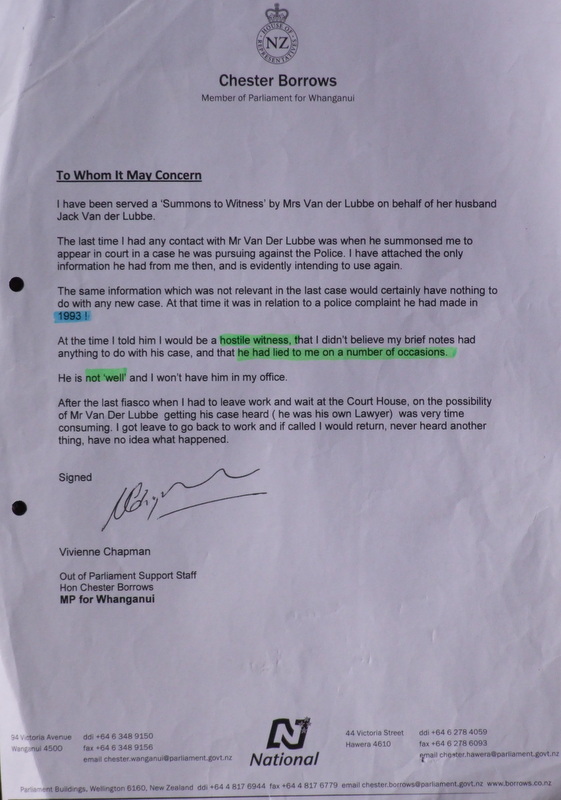 02 The SIS and the NZ Police cover-up a case of manslaughter, CONFIRMED by the offender Eric (Louisa Marie) van der Lubbe. From Detective Colin Irvine all the way to the top. 06 Gates don’t walk do they? Constable Richard Baker. Again! 07 “I’ve got you now, you’ve made a fatal mistake” (1992) Constable Cullum McGillivray. Sergeant Gary Patterson, et al. 08 Shots Fired, Sergeant Chris Roe. 09 AGENT PROVOCATEUR, Senior Sergeant Neville Haggart. 10 Half Baked Rambo, Senior Sergeant Neville Haggart, Sergeant Bob Burns, Sergeant Paul Donnellan. 11 Depositions, Constable Cullum McGillivray, Sergeant Gary Patterson, Senior Sergeant Neville Haggart et al. 12 The Trial, Constable Lance Walker, Inspector J H Mansell. et al. 13 The flag pole, Sergeant Paul Donnelly, Constable John Grace. 14 The Stalker, Sergeant Gary Patterson. 15 KKK (Ku Klux Klown) Sergeant Gary Patterson. 17 Private Prosecution, Sergeant Gary Patterson, Constable Cullum McGillivray, Inspector JH Mansell, District Commander J M Thurston, PCA John Jeffries. 18 Assault, Constable Dave Kirby, Sergeant Gary Patterson, Inspector R M Gibson. 19 Falsified Document, Senior Sergeant Bob Burns, Constable W Sloss, Constable Lance Kennedy. 20 Daniel and Luke, Constable B F Billows, Senior Sergeant Gary Smith. 21 Watching and Besetting, Constable Pollero. 23 Attempted Murder, Inspector Gary Smith, Sergeant Tony Fink, Constable Stewart Nightingale. 25 ROGUES` GALLERY, are all cops bastards? 29 WHO MURDERED LIONEL RUSSELL? JERRY CORNELIUS aka JAMES CREEDMORE, Inspector Graham Bell, Detectives Colin Irvine, Merv Theobald, Lindsay Edwards, Ernie Dickenson, Rod Drew, Peter Scott, Rob Butler, Jock Coleville et al. 30 THE MANSELL MEMO, malicious prejudice. 32 What Does The Word Ombudsman Actually Mean? 40 CATHERINE J KENNEDY, a shocking story of elder abuse by a Grey Power employee.